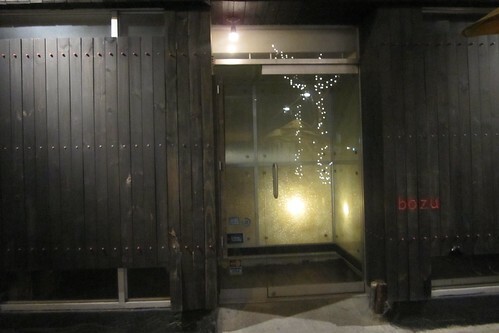 Located on the South Side of Williamsburg, Bozu has a mysterious facade like the izakaya Zenkichi, but serves fusion sushi. 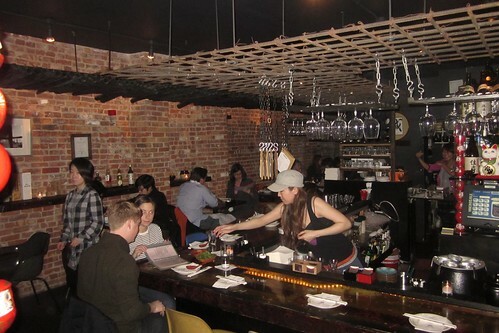 Inside, you have the main bar room/ dining room. But like Blue Ribbon, more seating areas can be found hidden in the back of the restaurant. I know. You hear me complaining about fusion food a lot. 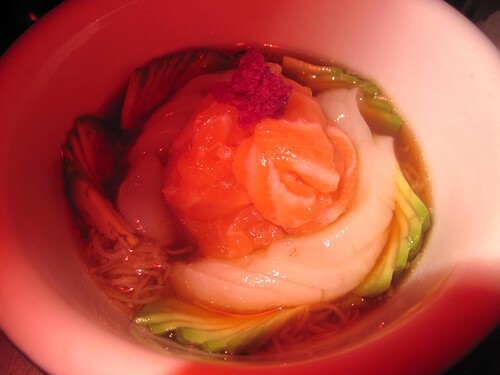 But the taste and textures of Bozu's dishes meld together so well that frankly it shut me up. Highly recommend starting with a shiso mojito (refreshing) and wasabi martini (clears your sinus). 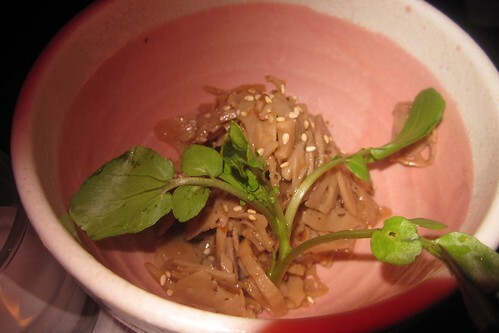 Lotus roots with sesame seed oil and seeds. It doesnt look like there's a lot, but its amount lasted us the whole entire meal to snack on. The crunchy texture and aromatic flavors is a great update to ordering edamame (which you can boil yourself at home). Ryoan bozu original ceviche in sticky yuzu sauce, comes with salmon sashimi and your choice of scallop sashimi or yellow tail sashimi. Beautiful presentation and fresh fish! 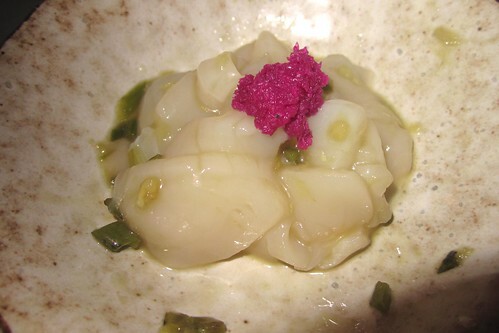 Hotate Punch scallop sashimi marinated with fresh wasabi stems. Scallops are a favorite of mine. Adding the wasabi updated the taste-- but just dont take a sip of your wasabi martini afterwards. Overload! Our bombs. Basically they are supersized nigiris. 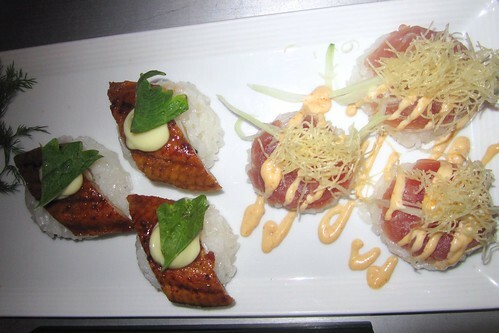 Packed with rice, layered on with your choice of fish, and comes as 3 pieces. I embraced their interpretation of the original nigiri. The eel was definitely good, but the spicy tuna...needed to be spicier. But the all time bomb is their blue fin otoro bomb. Twice the price of a regular bomb, but otoro's are the best. 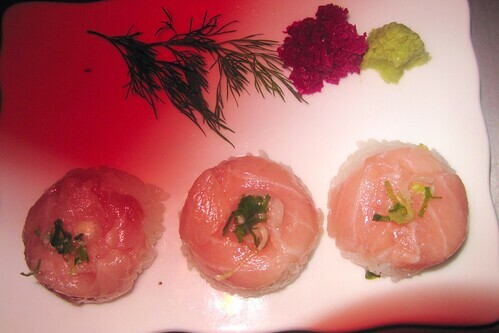 So yeah, Bozu is now on my list of recommended fusion sushi restaurants. For 2 of us it was only $80. Now, Im really curious to try Aki Sushi. I hear their uni coco rocks.